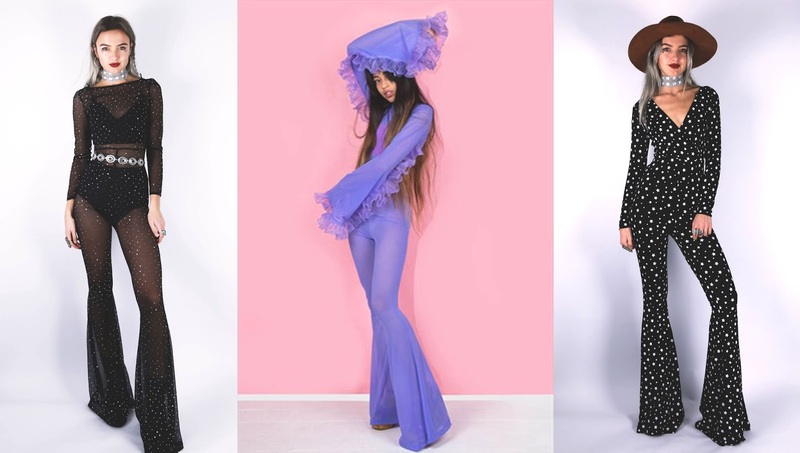 So my last couple of ethical brand features have proved pretty popular with you guys, and as it's coming up to festival season and I'm looking for some clothes that I feel are fit for them festival vibes, I thought I would share some with you guys! I don't encourage buying clothes for one use here, festival clothing is something that is, a lot of the time, designed for one use but I'm looking for clothes I can wear to festivals, nights out, and other cool events. I have two festivals this year and am also going to Carnivale in Cuba, so any pieces I buy are going to be getting multiple wears just this summer and will be kept for future too. This post features a few brands I think are festival worthy and then also just a collection of awesome items I have found. They have velvet body suits and metallic catsuits, the dream! Velvet bodysuits are ttoally things that are versatile and can be worked into every day, or worn on their own for a killer festival look. With their pieces Ethically made in LA. They also have a collection of really cool leggings and sportswear so will definitely be looking there if I'm need of new sports gear. Ugly shirts are definitely a simple festival worthy look, I say this but I wear 'ugly' shirts every day, I basically live in vintage shirts and I love it; but I do always see them around at festivals. Best Days vintage also has some cool comfy trousers too so you can spend your festivals, and your summers, lounging around in the sun in comfort. Ok so I saw this backpack and knew I had to feature Hullabaloo vintage, look how amazing it is! Plus they have tonne of awesome festival and general life worthy pieces, all second hand. All of loonigans pieces are ethically made in London, with scraps being reworked where possible and the brand working for charities where possible too. All of their sequin pieces have a range of patterns and colours that you can chose from and their infinity bomber jacket is just the coolest thing. Willows call is an independent label designed and made in Liverpool, Uk. And wow their pieces are super unique! They have super awesome jumpsuits that'd work for festivals, parties, or just when you want to lounge around the house feeling super fancy. Another independent British brand (there seems to be a theme here) with everything made in London, even sourcing their fabric locally, these guys give me a bit of a Lazy Oaf vibe (but with more transparency and ethics). I found these guys and immediately loved their stuff because I am a huge sucker for anything with clouds on, yet I still don't own any cloud clothing. lastly, here's a load of pieces I found that are super cute and ethical, from a range of ethical stores I found on my travels on the internet. This feature turned out longer than I expected it to be, I found a lot more ethical brands than I expected. And you may notice a lot of them are from ASOS marketplace because I ended up searching through there a little and stumbling across some really cool independent, ethical, British brands.It's a great place to look but you do need to do a little bit of digging to find out the ethics of brands. Also a fair few etsy because that's the home of independent brands from all over the world. They're there if you just go looking for them! So like I said before, these are looks looks for festivals but I definitely don't encourage one use consumerism! Buy pieces you love and can wear again and again, while looking fab and quirky in the process (how however else you look, rock being you). That's it for this Brand Roundup post, let me know if you want to see more of these, I might even make them a monthly thing!